Elliott Strahm captured the 3-2-1A HWT title for Sabetha. 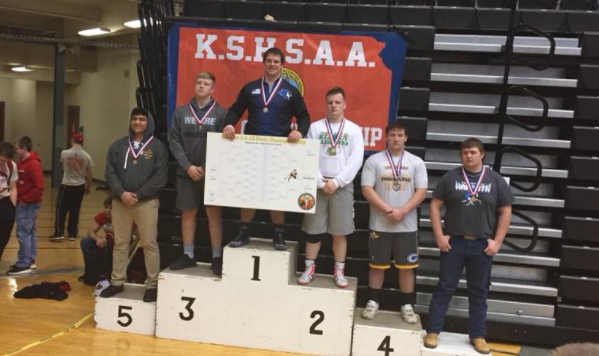 The Rainbow Communications Athlete of the Month from the Northeast Kansas coverage area is Sabetha High School junior wrestler Elliott Strahm. Strahm, an all-state football player and 3A Defensive Player of the Year in Kansas from Sports in Kansas last November for the 3A champion BLuejays, is having quite the athletic school year. Last month he captured the 3-2-1A Heavyweight state title in wrestling, giving him his second state title of the school year and first ever in wrestling as an individual. Strahm entered as the underdog in the 3-2-1A tourney but came out the state champion as he upset Avery Hawkins of Smith Center in the title match. Hawkins had just one loss all year entering the match. Strahm finished the year at 35-8 over his junior campaign. Strahm has made himself into one of the top multi-sport athletes in the state of Kansas this season and has an entire senior year left. He will be one of the top returning football players in all of Kansas for the 2018 season. Rainbow Communications would like to congratulate Strahm on an oustanding junior season so far!